Well …. let’s just say there’s a first for everything …..
Soooo, how about a “Follow-up Friday”-post on a Saturday? 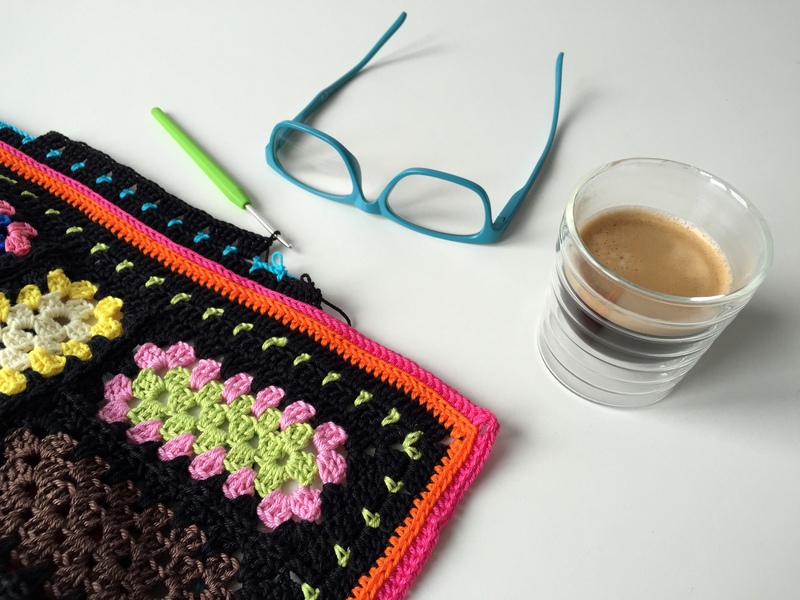 For a pretty organised and control-freakish kind of person like me, it was a big step to accept that “no”, I was not going to finish my “Crochet Mood Blanket”, ànd take photos of it, ànd put a blog post together yesterday….. It was something Quinn said, that made it clear to me that this was actually ok – thank you, sweetheart! 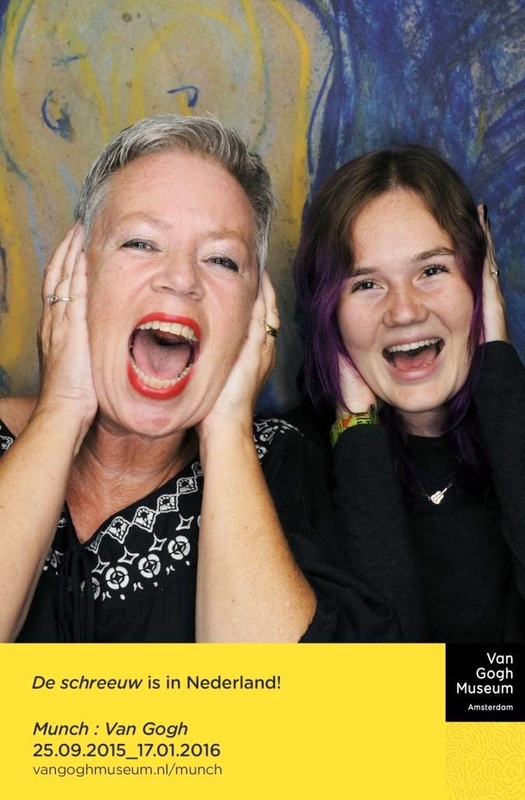 On a totally non-related side-track: this sweetheart and I had a great time yesterday evening, attending the opening of the “Munch : Van Gogh” exhibition in the “Van Gogh Museum”……(oh, and this youTube-film is absolutely wonderful; informative is this one). But: without further ado, let me present to you my “Crochet Mood Blanket”; started in 2014, finally finished in September of 2015! If you want to read back as to how and why this blanket was begun, this is where you’ll want to go. The pattern I used can be found here, with a little note that I adjusted the rectangle a tiny bit, so that two short sides had the same size as its long side. This allowed me to play around with the lay-out of the squares, when I commenced the joining. Quite some thinking went into the border. 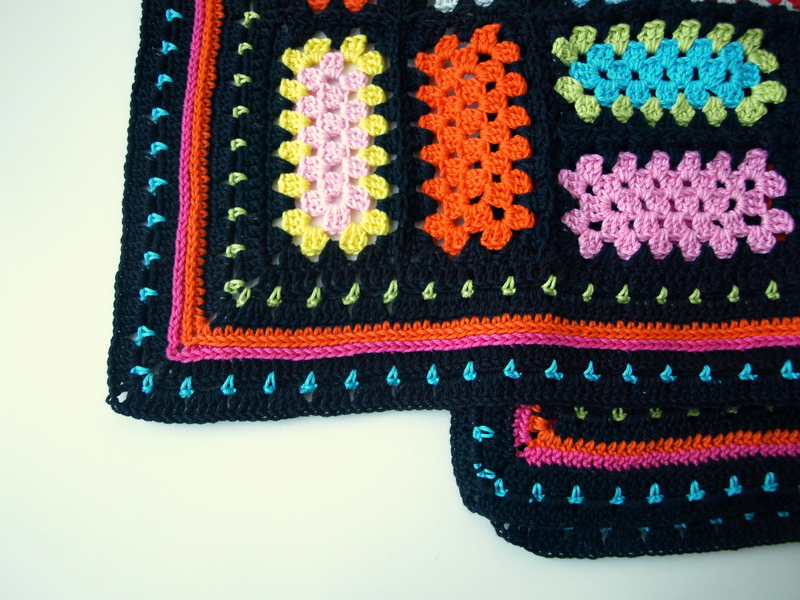 At first I thought a simple border would be best for this colorful piece of crochet, but after a couple of tries I went for a more elaborate one and am absolutely happy with the way it turned out. 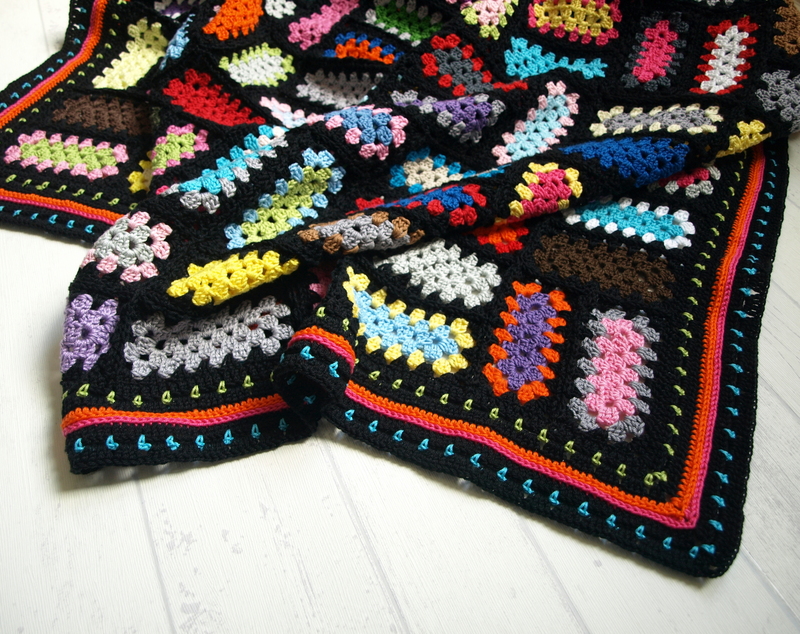 “Boho” comes to mind, when I look at this blanket. For the border I went down 0,5 mm to a 3 mm hook and did a simple round of black dc’s (UK: trebles). Second round with green was a sc (UK: dc) in between every 4th and 5th dc from the previous round, chain 3 – and repeated all around. Third round – with black again – I crocheted 4 dc’s in every chain3-loop (you can find a great tutorial for this so-called “block-stitch” here). Inspired by this beautiful border on Ryane’s latest blanket , I crocheted two rounds (in orange and pink) using this stitch, and I love how these rounds give some reliëf to the border. The last 3 rounds were an exact copy of the first 3, the bright blue being the accent color here. When I posted this photo on Instagram, someone asked me why I was crocheting on three rounds at the same time? 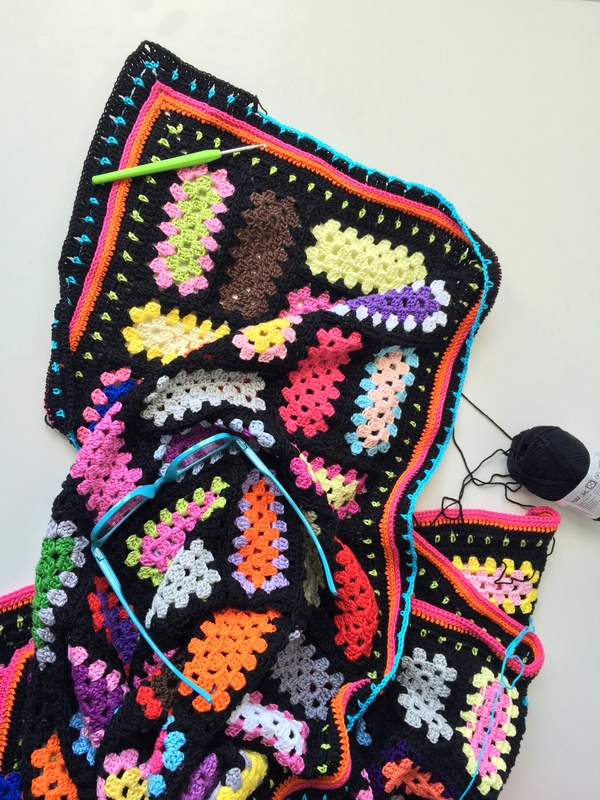 I do this to get a feel for the final lay-out – it’s not until I like what I see that I go ahead and crochet all around my blanket/cushion cover. * number of squares: “only” 192 instead of 365 …. Do I like it? Oh, yesss! I’m very happy with the result. Also: very happy to have finished another old-wip. If I’m correct there’s only 3 projects left on the wip-list: the “Rustic Lace Square”-blanket – which is an ongoing project, so not really counting. 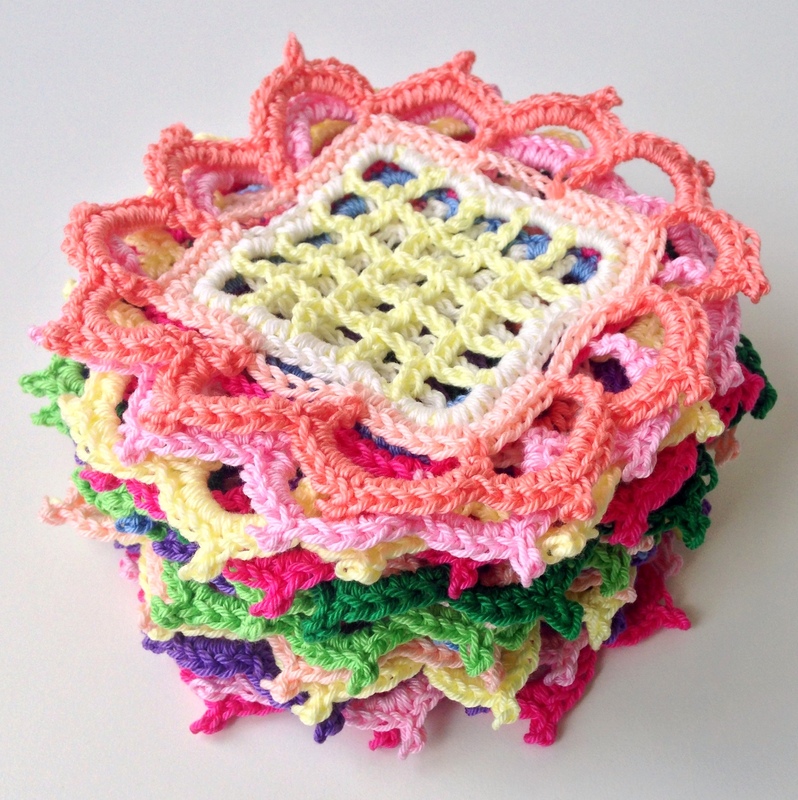 Secondly, the Simply Crochet Squares (still no idea what to do with them …..). And then I need to write down the pattern for the square I designed to make my “Les Tourettes”-shawl. 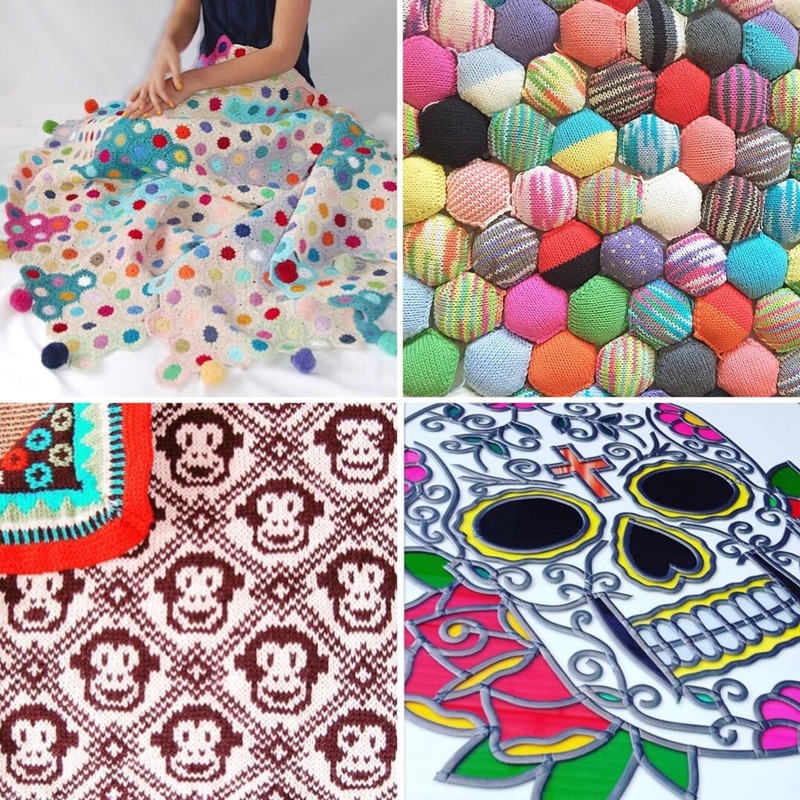 Bottom right: Tina‘s very uniqe and fabulously made candy skull lead picture. Next week I’m taking a short break, having been invited by my brother and his husband to come and visit them in Cannes: how awesome is that?! Wishing you a wonderful weekend and week ahead! Beautiful blanket. Could u tell which method of joining u followed to join the rectangles. I love this blanket. I’m inspired to make one. Do you have a photo of it fully laid out so I can do the right placement of the rectangles? I would appreciate it. Absolutely love this!! Do you have a picture of the placement of rectangles? would love to try this. 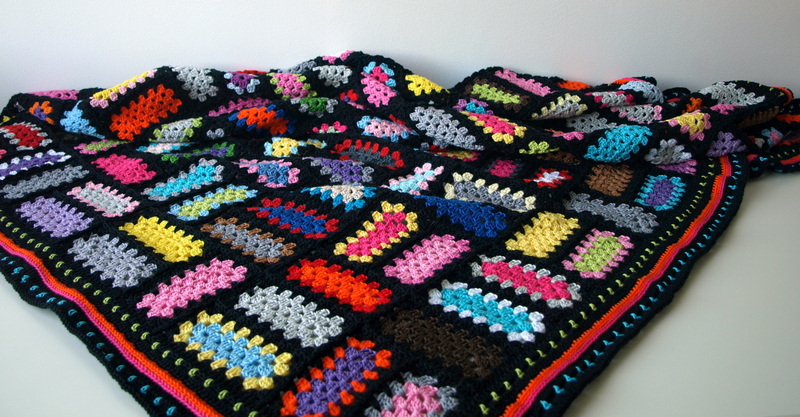 Lover the Mood blanket hope you can provide the placement of rectangles and more details on the joining . That also is so great join as you go rather then sewing together. You did a beautiful job. Love it. Thank you. 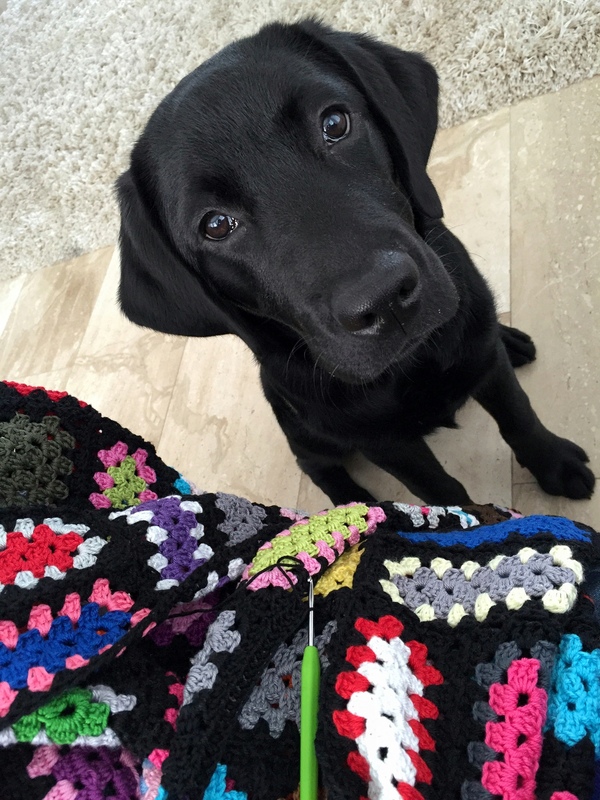 Do you have a tutrial to show us how to crochet the black around each granny rectamgle please.? 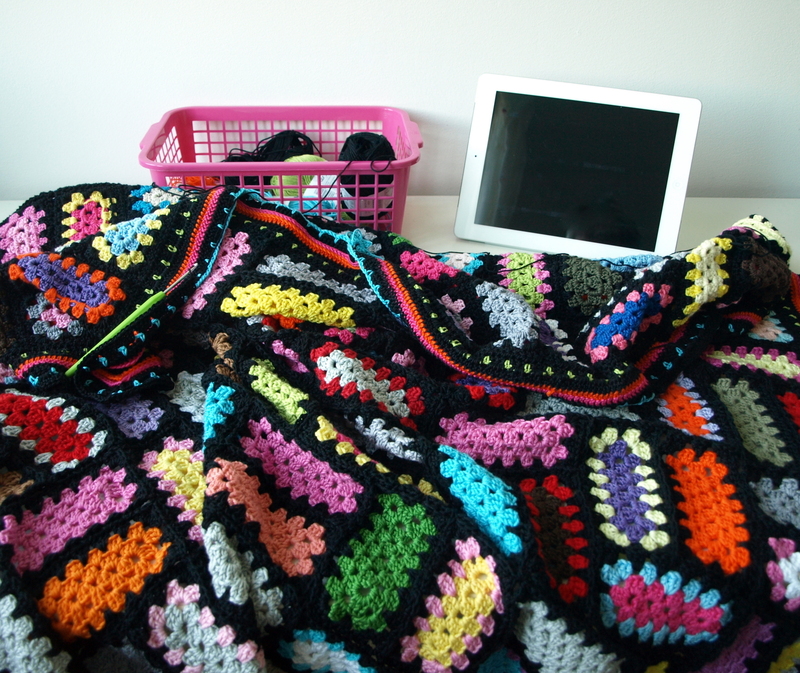 I have all the rectangles finished but am at a loss on how to crochet them together. 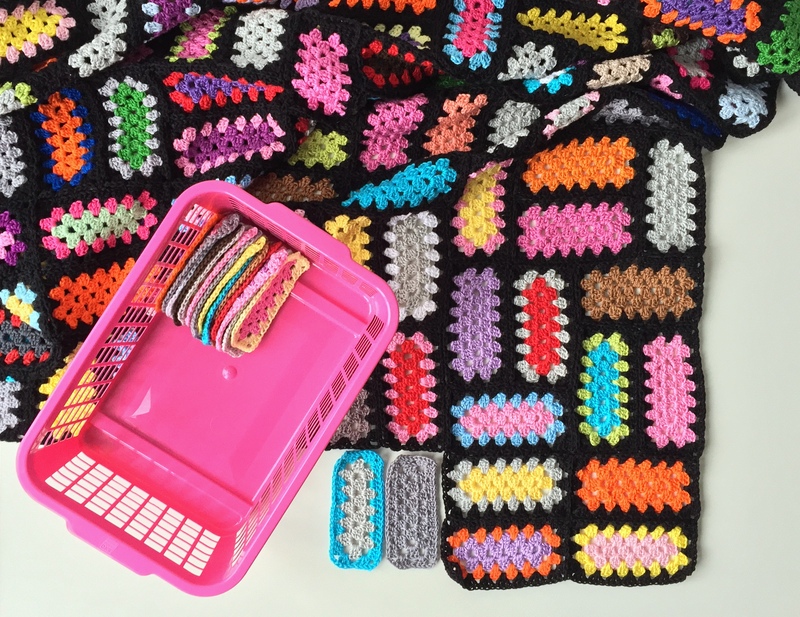 If you google “granny squares – join-as-you-go” I’m sure you’ll find some very helpful video’s on YouTube, that will get you joining your rectangles without any problem!